Deputies with the Community Orientated Response Enforcement Team are asking for the public’s help in attempting to identify and locate a person or persons responsible for several graffiti incidents within the City of Lancaster. These incidents have occurred over the previous several months and are believed to be gang-related graffiti. The graffiti has been seen mainly in the area between Lancaster Blvd to Jackman Avenue and 10th Street West to12th Street West; however, some similar graffiti has been seen in other parts of the city. 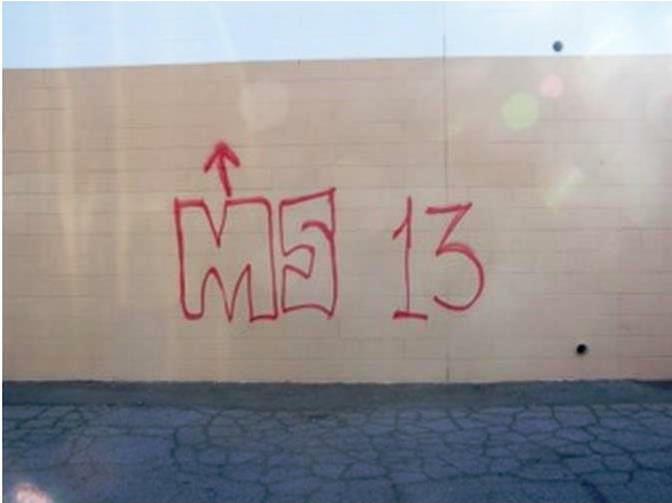 The graffiti is described to be in red spray paint and with the name of “MS13”. The individuals involved are responsible for several thousand dollars of damage to private and public property. Most of the incidents are believed to have occurred during night time hours. The public is asked to report any suspicious activities to the Lancaster Sheriff’s Station at 661-948-8466. The public can also report information anonymously through the Los Angeles Regional Crime Stoppers Program. Through this program, the reporting party could qualify for up to a $1,000 reward if the information provided leads to an arrest and conviction. To use Crime Stoppers call 1-800-222-TIPS(8477), or go online to www.lacrimestoppers.com, or Text message a tip at “CRIMES”(274637) and message TIPLA then your crime tip information. For further information go to http://lacrimestoppers.com. 29 comments for "Help authorities catch gang taggers, reward offered"
I am glad to read that the city of Lancaster and Law Enforcement are stepping up the battle against graffiti. Graffiti is hardly a victimless crime. While as some of you state, this MS-13 tag may be the work of wanna-bes it is irrelevant. There is far too much graffiti throughout the Antelope Valley. Many want to blame various groups for the tagging but the bottom line is that in most cases these are children and young adults that have not had the right morals instilled by their parents. Many of these children tag their own items with their gang or skate crew tags. I truly believe that if the parents of these tagger actually investigated their own children they would have to know that their off-spring are not developing into upstanding members of the community. The fix starts at home. If you have teenage boys, please hide or throw away your spray paint. I have always wondered why we do not see the apprehended culprits out cleaning our cities as part of their restitution. There are many areas in this valley that could be cleaned by those ordered to perform community service. Yes, the apprehended culprits should have to clean it up…but, the union members probably would file a grievance or the city would be liable for all the fake injury claims. Hiding or throwing away your paint isn’t gonna do anything to stop this. These kids buy and steal paint all the time. You just have to show i.d. and ask for it to be unlocked or buy the size that isn’t locked up. Most parents of taggers are in denial about where their kid is after dark on his bike or the kid is sneaking out after mom and dad go to bed. Then you have those kids who learned from the parents. Just in case any of you didn’t know… Most of these so called taggers aren’t even kids. They are what our society considers an adult between the ages of 18 and 24. I worked with at risk youth for 10 years and most of the taggers I worked with came from very decent families with parents that worked so much and hard to provide for them that they were never at home to pay attention to them, so it’s not that the parents didn’t teach them morals… the kids simply became rebellious. Sad, but true. I was a witness for the city quite often in graffiti cases and all but one time it was in Juvenal court. I did graffiti abatement with the city for 15 years and were asked often if we would use arrested taggers for help. The short answer, NO, we didn’t want them knowing anything about us, where our shop was, who we were,etc. The main problem was their safety, if they were a member of a tagging crew and were seen by a rival gang removing the rival gang’s tags that could cause problems we did not want to deal with and the city did not want to be libel for. But believe me we had much nastier jobs for them as community service workers. To me that tagging does not look authentic, it seems like some kids just thought it’s cool to tag that. It’s crazy that we are letting these idiots get away with this! Someone knows something! Report it as u see it! Believe it or not, but The good outnumber the bad in this Valley! We must keep our eyes and ears open and report it!!! Turning away and then complaining about how this valley is a crap hole is not the solution! Criminals, “gang bangers”, taggers…..let them and their no good cronies, get the message…….YOU are not welcome here!!! They are too comfortable, let’s make them uncomfortable!!! Take back the AV! We are not a dumping ground!! I’ll be watching! MS 13? Wow, that’s great! The Antelope Valley is on the down slide. FACT: On the average there are approximately 2000 parolees living in the AV. FACT: The Antelope Valley is known state wide as a haven for child molesters, either on parole or just plain hiding out. FACT: The Antelope Valley has one of the largest population if illegals in the state. FACT: The Antelope Valley is a s*%t pit! Time to get the hell out of the AV,,,,,,, which stands for, ANOTHER VICTIM! FACT! Illegal people do the jobs that born Americans don’t want to do! FACT! There’s more whites on the welfare system then blacks or Hispanics! Who’s to blame for all this garbage being sent out here to the AV, our LA representatives. They cleaned up LA but sent the trash out here! you are brave…these gangbangers will kill their own family for speaking up…hell, they will kill just for the fun of it…and laugh doing it. The City of Palmdale used to have a $1000 reward for info on taggers. In the first year they paid out $24,000. Opps, little to successful there. I think now you get gift cards for the Mall or something. Funny thing about tagging, it’s the only crime where the purpose is to identify yourself. I worked in the graffiti abatement game for 15 years. I’ll tell you what’s going on. Some little 14 and 15 year old wanna be gang bangers see the Discovery Channel show about the big bad MS 13 gang infiltrating America and thinks it would be cool to put that tag up all over town. All in a days work for the graffiti abatement crew. what do you mean ” MS13″ infiltrating America? MS13 was started RIGHT HERE in Los Angeles in the early 80’S in the Union District….most of the members Parents were Illegal. They are ruthless and have no respect for human life! Let us hope the Law rids AV of them before they take root! What’s scary is that I live near those sections! I’m already too scared to even take my dogs for a walk at night. Hope they bust those taggers! What you should be scared of are the ones who don’t spray paint on the walls. The ones painting graffiti are usually just the wanna-be’s. True. You never know where they could be, even in the nice neighborhoods. I’m hoping I can learn some self-defense in case I ever need it. Where was Rexs precious eye in the sky to catch these thugs? No where to be seen, amazing. Look at the LEAPS aircraft it says City Of Lancaster on the side , not LA county. You arguement is feckless as Sherrif Lee Baca would take your 1 million and more and you would not get one single extra police officer. LEAPS is local law enforcement for Lancaster. LA county sherrifs office is huge and your measily one million would be a drop in the ocean of retirement accounts, union dues and operating cost. Parris did what he could with Lancaster funds and no local police department. Yes if you look at the LEAPS aircraft it says City of Lancaster on the side , not LA county.Yes if you look at the LEAPS aircraft it says City of Lancaster on the side , not LA county.Do you know why?Do you know why?Because no other city is stupid enough to pay $90,000.00 to catch Walmart shoplifters.Because no other city is stupid enough to pay $90,000.00 to catch Walmart shoplifters.Only Lancaster which is run by Rex.Only Lancaster which is run by Rex.And his rich friend Frank.And his rich friend Frank.Meanwhile our crime goes up.Meanwhile our crime goes up. We need more sherriffs not LEAPS.We need more sherriffs not LEAPS.More boots on the ground.More boots on the ground.We are paying $1,080,000.00 a year for 10 years.We are paying $1,080,000.00 a year for 10 years.That is $10,800,000.00.That is $10,800,000.00.How many sherriffs could we hire for that?How many sherriffs could we hire for that?No to LEAPS.No to LEAPS. That is a good point James Stouvenel.That is a good point James Stouvenel.It flies around and does nothing.It flies around and does nothing.Did you see the paper today?Did you see the paper today?Crime is up in Lancaster.Crime is up in Lancaster.Crime is down in Palmdale.Crime is down in Lancaster.Who has LEAPS?Who has LEAPS?We do.We do.We pay $90,000.00 a month for what.We pay $90,000.00 a month for what?To catch Walmart shoplifters?To catch Walmart shoplifters.And watch our crime go up.And watch our crime go up.We need more sherriffs.We need more sherriffs.More boots on the ground.More boots on the ground.We do not need a useless flying tin can that makes Rex friends richer.We do not need a useless flying tin can that makes Rex friends richer.$1,080,000.00 a year for 10 years.$1,o80,000.00 a year for 10 years.That is $10,800,000.00.That is $10,800,000.00.How many sherriffs could we hire for that?How many sherriffs could we hire for that?Rex and Frank live behind gates while we live in fear.Rex and Frank live behind gates while we live in fear.No to LEAPS.No to LEAPS. You ever notice “turd” if thats is your name , that cops never show up until after the crime was commited. More police never equates to less crime. You live in a time of increasing crime thanks to morons who keep voting for social goodies provided by sick politicians. The future is surrvielance systems like LEAPS. Its the only crime deterance method. LEAPs is primitve but its a start. The criminals have no fear of slow moving cop cars that they can see and avoid. They do fear being videoed jacking your stuff out the back of your house after they break in. You can cry all you want about the future but you cant stop it from happening. Is the plane invisible and not able to be seen from the ground by a would be criminal? Your grasp of principles of crime deterrence is underwhelming… As is your knowledge of history, law enforcement principles, and investigation clearance rates. Having more Deputies DOES help reduce crime as there are more deputies to be able to engage in preventative measures, as well as assist in investigations that are ongoing (which allows for a higher clearance rate and more captures of criminals). Rex’s little Eye in the Sky is a total bust. ESPECIALLY when you consider that these types of crimes are what it is supposed to be specifically targeted to help with! Some of the tagging is being done during the day time hours. I have driven past walls without graffiti and an hour later driven past again and it’s been tagged. If it’s being done after dark, some of these kids are out AS SOON AS IT GETS DARK. That’s right, @6 PM, they meet up, sometimes behind Valley Central Petsmart, and head out on bikes with backpacks. This is what happens when you promote affordable housing and section 8 it allows for low life scum from LA to move up..the article states that “its believed to be gang affiliated” of course it is ms 13 is a salvodorean street gang from LA I hope these idiots are found and thier families should loose their benefits..these people are already leeching off the gov and now more money has to be spent to clean up the mess their stupid kids create..parents should be held accountable for their disrepectful douchebags..really its 2013 gangbanging is for p*****s..these are wannabes tagging up the set you claim in a suburb is just pathetic fing b*****s!